You could be the most qualified person for the job position you’re applying for, but it won’t matter if you don’t interview well. The fact that you’re getting an interview means you’re qualified. Think of an interview as an assessment of you as a person. What your values are; where your goals lie; how well you communicate. Essentially, they’re finding out who you are in an hour – often, less than that. That’s a lot of pressure! However, there are skills you can practice before an interview that will make you more prepared and able to walk away confident. To leave an impression on your potential employers, practice these nine interview skills. The first thing anyone notices about another person is how they look. It may seem superficial, but it can work to your advantage; after all, if you’re qualified, but show up to work in an elf costume, they may not even give you the time of day. People need to see that you’re competent enough to put an outfit together. They need to see that you’re ready to work and not, say, ready to go to the beach. How you dress reveals much of who you are and you want to look qualified, confident, and capable. A new job – even if you have one already – is an event that needs to be treated with levity. What may be a nice change of pace for you could be someone else’s livelihood. Dress like you’re aware this is a monumental opportunity. Practice speaking well. If you pause with “uhs” and “ums” a lot, then pause before you speak. There’s a whole science behind your speech patterns, and linguistic habits can be hard to break. You don’t want to be judged as inept simply because it takes you awhile to organize a verbal sentence. In that regard, don’t be afraid to be quiet for a minute. Pause. Think. Organize. And then respond. If your response is communicated clearly, you’ll come off better than if you ramble or talk in circles. Also, don’t try to fake speech habits that make you come off “smarter”. For instance, some people think an accent can make them sound more (or less) qualified, but don’t try speaking unnaturally. Your employer is assessing the content of your answer, not how you sound. Additionally, it’s often said that people who talk fast “come off” as more intelligent. Unless you talk fast naturally, avoid doing this. You don’t want to be redundant, you want to answer the questions to the best of your ability. Going hand-in-hand with the previous point, you should practice your nonverbal communication in addition to your verbal communication. A handshake says a lot about someone as does your attentiveness. If you know (or have been told) that you don’t seem like you’re paying attention, then watch yourself in a mirror and see what it is you’re doing. If you catch yourself staring past the person you’re talking to, or are consistently distracted by your phone, then hone in on the other person. Your interviewer wants to see that you’re making eye contact and paying attention to the questions asked. Moreover, if you tend to slouch, sit up straight. If you talk a lot with your hands, then consider dialing it back. Composing yourself will only work to your benefit. Something that’s lost on many young (and old) interviewees is the professionalism of a job interview. You are not going on a lunch date or reuniting with a long-time friend, you’re selling yourself as qualified for a job position. 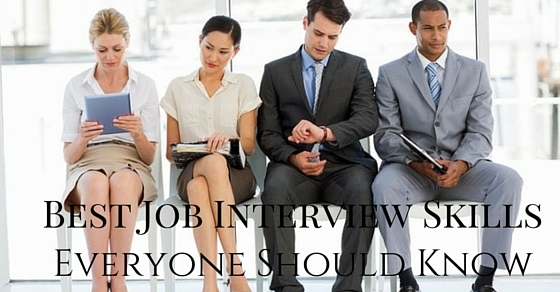 You don’t want to start treating the interviewer as you would a friend. Be respectful and keep a professional distance from him or her so you don’t overstep your bounds. This may seem obvious, but with the list of 4 interview skills already provided it’s easy to get lost in the shuffle. You don’t want to be so self-conscious of your composure that you tune out your interviewer completely. You need to listen to ensure that you understand the question and can respond concisely. 6. Don’t Understand? Ask For Clarity! This is imperative! Too often, someone walks into an interview thinking they need to have answers and if they don’t have an answer, then they make something up because saying, “I don’t know” simply isn’t viable. Always ask questions or ask for clarity if you don’t understand something. The person interviewing you is human and they may not be as articulate as they need to be or they may be thinking about other tasks they need to get done today. Plus, asking for clarity can work in your favor since, maybe you do know the answer to the question and they simply used verbiage you didn’t understand. Always ask! 7. Finished The Interview? Ask Questions! This may seem redundant at first, but it’s important to separate it from the former point. At the end of your interview, chances are the employer will want to know if you have any questions for him/her. Ask questions. The questions may be things you already know from looking up online – or the answer may seem obvious. In any case, ask questions. Your employer wants to know you’re invested in the company. They want to know that you’re curious about the work environment. In short, they want to know you’re as invested in this position as they are investing in you. It’s not always easy to do when you’re on the job hunt, but try to maintain a sunny disposition. If you look desperate, like you’re salivating at the prospect of this job opportunity, then you’re going to come across as less credible than you are. The fact is, if you look like you’re haggard from searching for a job, it’ll show. Instead, try to stay upbeat, even if you’ve got rent collectors knocking at your door, stay positive, it’ll improve your employability. How many candidates are dropped from the running for being too cocky; on the cusp of arrogance? Stay humble and stay respectful. This is an opportunity – even if it’s a step below what you’ve done in the past – be appreciative that they’re taking the time. Paul Langdon is the Job Connection Program Manager. Langdon joined Goodwill Industries in 2013 and has worked tirelessly in the employment program to help people find work.